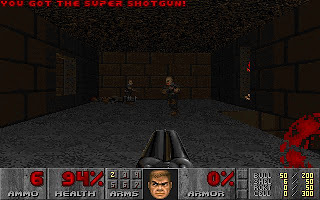 Doom 2: Hell on Earth was released by Id Software in 1994. 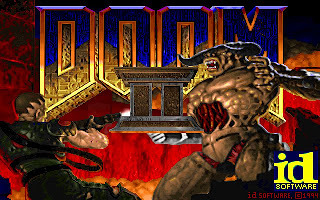 It is the sequel to Doom that was released in 1993 as a shareware. 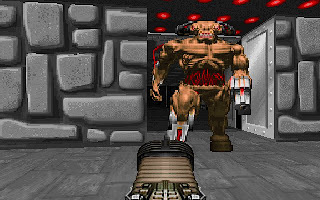 Unlike Doom, Doom 2 was a commercial release that sold in store shelves. 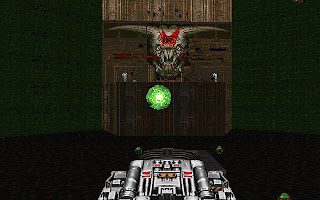 The story of Doom 2 follows immediately after the events in Doom. In Doom, we as the anonymous space marine has successfully fought through Mars and Hell. In Doom 2, we will return to Earth, but to find out that Earth has also fallen into the hellish invasion. During the game, we will learn that the remaining survivors of Earth's population are being held on Earth and the only means of escape is the space port with massive ships that can carry the remnants of Earth's population into space. However the demons know this and have placed a fire force field over the space port, so those ships cannot land or leave. We must battle through the infested space port and deactivate that fire force field. Once humanity is finally evacuated from the ravaged, infested planet, we will be the only human left on Earth. We sit and wait for death, content in the knowledge that we have saved the human. Soon, we receive transmission from humans in orbit that they have managed to find out where the armies of Hell are spilling from. If we can reach this gateway, we can thwart the invasion once and for all. After going through all the 30 levels, we will finally reaches the home of the "largest demon ever seen". It is the most difficult part of the game, where we need to fire a number of rockets into the exposed brain of the demon. Of course, to fire rockets alone is simple, but there are unlimited number of demons that will keep attacking us while we complete the task. And the demons is full force, meaning that all the bosses in other levels will appear at once! Technology wise, Doom II is no difference than Doom. We still cannot jump, look up and look down. The only difference that I can sense is the larger maps and larger groups of demons. The story is still a linear progress, which require us to collect key cards to access to the next area. You can download Doom 2 full version here. "Doom 2: Hell on Earth was released by Id Software in 1994. It is the sequel to Doom that was released in 1993 as a shareware. 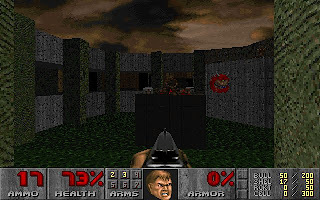 Unlike Doom, Doom 2 was a commercial release that sold in store shelves." What? Only the first campaign of Doom was shareware; the other three were commercial. The shareware version didn't even have all the weapons. "The only difference that I can sense is the larger maps and larger groups of demons. The story is still a linear progress, which require us to collect key cards to access to the next area." 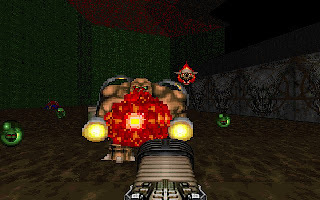 Doom II brought the Super Shotgun to the scene, along with seven all new monsters. Those additions had a profound effect on overall gameplay.